Compellingly written in Tiro's voice, Imperium takes us into the violent, treacherous world of Roman politics, and the quest of one man - clever, compassionate, devious, vulnerable, and above all Roman - to reach the top. Start reading Imperium: (Cicero Trilogy 1) on your Kindle in under a minute. Ancient Rome is the setting for the stunning new novel from Robert Harris, the number one bestselling author of Fatherland, Enigma, Archangel and Pompeii. Colleen McCullough, the sadly deceased Australian author, wrote a series of historical novels, more history than novel in fact, on ancient Rome from 100 BC through to the establishment of the empire under Augustus, who won the civil war that came after the assassination of Julius Caesar. It was in that civil war that Cicero, who championed the cause of the Republic, lost his life. Colleen McCullough favoured Julius Caesar's cause and did not portray Cicero in such a good light. Robert Harris takes the counter view and shows Cicero as a great talent and champion of the Republic, and what a great series of books he has written. If you have any interest in Roman history, you will love this book and the others in the series, and perhaps you might be inspired to read Colleen McCullough for a different view. Cicero has seemed enigmatic to me in the history of the late Roman Republic, perhaps because he is portrayed more often than not as both the brilliant statesman of his time yet paradoxically doomed because of the very forces of history in which his brilliance shone so brightly. But that is hindsight. This novel shows the complexities of the man and the ferocious contradictions of the Roman political system. It's one thing to read of the machinations of the first Triumvirate, but quite another to see how it was felt and perceived by those in the maelstrom leading up to those times, when it was still entirely possible that the Republic might yet endure and resolve its inherent contradictions. Caesar's rise to power was no more inevitable than Cicero's own. Which man was the greater leader, which had a clearer, more realistic, and sustainable view of what Rome could become? We think we know something of Caesar's all-consuming vision, though he didn't live long enough to implement it in full; perhaps Augustus and the emperors that followed fulfilled it, perhaps not. We shall never know. Surely, though, what a different vision Cicero had. If his vision for Rome had triumphed, we would know from example that representative democracy can long endure, something that is not at all clear or inevitable today. 5.0 out of 5 starsWell written and well researched. 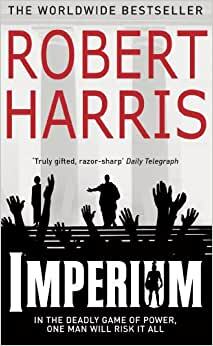 Robert Harris uses English language as a craftsman. Beautifully written and historically informative. Will get the following books in the trilogy. Great historical novel. Anyone who studied Ancient History or Latin will appreciate the effort of the author to give us this great story. Will definitely be reading the next two books in the trilogy. 5.0 out of 5 starsDifferent, interesting, engaging - loved it. Loved it. The style of writing, the topic it covers, the characters it depicts, and layers involved in having a slave and confidant tell the story - its just fantastic. Outstanding novel for those whom love history and politics.